"...the first to completely conform to the Windows graphical user interface, allowing enginners to be productive without extensive training." 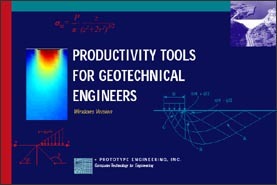  Productivity Tools for Geotechnical Engineers is a new departure in programs for the geotechnical engineer in that it combines an explanatory text with fully operational software that can be used in practice or for educational purposes.  Example problems show how the software can be used on problems typical of engineering practice.  Because the software is efficiently programmed, it will run on virtually any PC-type machine, including palm-tops.  The expository text concentrates on explaining what the analysis does, what the basic assumptions are, and what problems and misunderstandings are common.